Are you as excited for Talon as I am? I was so sure this was somehow part of those vampire series. I didn't enjoy those too much. I'll give fey ones a try but I'm wary. This one I'll look out for and MAYBE read someday. This sounds so good. I so want to read this book. 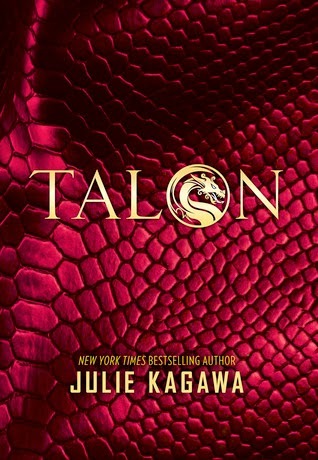 I loved Julie Kagawa's vampire series so I'm pretty sure that I'm going to love that one too. Dragons! My current obsession at the moment, with the book coming out late October it may even be my first November read. I can't wait for this one either. I wasn't too crazy about her last book, but this one about dragons sounds awesome! I love this author and the story with dragons cant be boring. I am so excited to read it. Great pick! Eep, I love this one! I met Julie at ALA very briefly but I couldn't stay until the promo-event where I could have gotten an ARC :/ I'll definitely pick it up when it comes out though! Undercover dragons!! Awesome pick, hun, and thanks for stopping by! YES!! I want this too! Absolutely 100% ready for this one :D I read the first chapter and am now even more hooked. There's a lot of potential here. Great choice! Jaclyn @ JC's Book Haven. I am excited for this as well.I loved her Immortal Rules series. Me too! Me too! Meeee tooooo!! Can't wait to read this one! I loooove Julie Kagawa, so I'll read anything from her! Dragons are always fun, too. :) Great pick! !